Tomorrow is Veterans Day in my country. It’s a national holiday, related to Armistice Day, Remembrance Day and Volkstrauertag. I’ll be talking mostly about what’s happened since 1914, why I don’t fear the future, and what I think we can achieve if we use our brains. It’s been an eventful century. Those photos show what was left of Pozières in 1916. The top one is a view of the village’s main street. What happened there wasn’t all bad news. Someone returned to the Pozières site. The place was habitable, and inhabited. After folks filled in many of the craters, re-built the road and streets, and restored enough topsoil to make agriculture possible. That’s good. But Pozières wasn’t just the way it was. That’s inevitable. Change is among the few constants in this universe. In this case, folks made some good choices over the next century. I hope that at least some of the folks living in Pozières could get out. But they, or someone else, did what humans do: recovered, rebuilt, and tried to avoid doing what went wrong last time. Nearly a century later, some still remember. Considering what’s happened since, that’s not doing badly at all. That image, taken from Google Maps, shows Pozières in the early 21st century. Aside from a few architectural details and signage, it reminds me of many small towns where I grew up. Land near Pozières isn’t nearly as level as what I was used to. And paved roads in the Red River Valley of the North are almost always raised, with deep ditches. It helps keep them clear after light snow, and helps us find them after heavier snowfall. And that’s another topic. Back to the 20th century. Hostilities ceased on the Western Front of the “War to End All Wars” at the “eleventh hour of the eleventh day of the eleventh month” of 1918. World War I may or may not be the most destructive war ever. It depends on which statistics you look at. By any reasonable standard, though, it was bad. What with assorted genocides and impressively deadly weapons, about 6,000,000 civilians had been killed. I gather that the problem was, partly, less-than-precise weapons delivery tech. Smart these weapons weren’t. Small wonder that some folks thought it was the end of civilization as they knew it. The European and Euro-American glory days of the 19th century were gone. For good. But we had a few good times during the 20th century. Happily, we also grew a little wiser. Enough of us to make a difference, anyway. We survived another global war — or, in my view, the second phase of a conflict that started in 1914. The mess started long before Archduke Franz Ferdinand’s assassination set off a cascade reaction in Europe’s interlocking treaties. That’s a definite milestone, though. Ironically, the treaties had been intended to prevent war. European leaders apparently thought they could avoid war by making the next one more cataclysmic than usual. That’s why they crafted a web of treaties. By the time they finished, pretty much all European countries would defend or attack each other if anyone started the sequence. The idea goes back at least to 1870. We tried it again, after 1945; and got lucky. Or maybe enough leaders realized that they were on the front lines, like everyone else. Or meant what they said about wanting peace. The 1870 theory was sound. In a ‘mutual assured destruction’ system, no rational leader would attack if the action would result in retaliation from other nations. It would have worked in the early 1900s. In a world where all leaders were completely rational. That’s not what our world is like. Not even early-20th-century Europe. There was more going on, of course. I’ve yet to run across a truly simple situation in humanity’s long story. Since very strange notions about logic and faith, reason and religion get taken seriously, I keep repeating pretty much the same thing. Using our brains is a good idea. That’s not just my opinion. I’m a Catholic, so using my brain is a requirement. That may take some explanation. I could decide to not think, acting on whatever daft impulse comes along. I’ve found that it’s easier than thinking, in the short run. It can even result in enjoyable experiences. Long-term results are less than satisfactory. Names change as “now” moves through time. So do attitudes, often more slowly. Somewhere in the 20th century folks in my culture started calling the 1914 through 1918 sequence of battles the World War, Great War, or War to End All Wars. None of those names stuck, partly because chapter two of the “war to end all wars” started in 1939. These days I mostly hear the 1914-1918 sequence called World War One or the First World War. The “First World War” moniker dates to September 1914, when biologist and philosopher Ernst Haeckel discussed what was happening in Europe. Calling it the “War to End All Wars” made slightly more sense when H. G. Wells wrote “The War That Will End War.” The book was published in 1914. Wells blamed Europe’s Central Powers for starting the war. He had a solution, too: crush German militarism. That’s pretty much what the Allies tried, when the Central Powers ran out of things to be broken and people to be killed. Not everyone agreed with Mr. Wells, or thought that punishing folks when their leaders lost a war made sense. Even in 1914, a fair number knew enough about history and humans to realize that one conflict is ‘the war to end war’ only until the next one. Some even thought post-war punishments should be vaguely reasonable. Someone, somewhere, may still call World War One the War to End All Wars without being cynical, sarcastic, or worse. Apparently quite a few experts still say that the Treaty of Versailles was pretty much a good idea. France, the story goes, was ever so lenient and restrained in how Germans were punished for losing the war. Not that experts put it quite that way, of course. I don’t think anyone who was involved came out Versailles smelling like a rose. Particularly the folks running that show. One of these days I’ll dig into just how restrictions on German industry, research, and related activities affected that country. I don’t think it helped that 15.1% Germany’s active male population was dead when Versailles was signed. A severe global economic downturn my nation calls the Great Depression started about a decade later. It affected everyone, not just Germany. Americans generally saw it mostly from our country’s viewpoint. So did many Germans. Germans had a few more reasons to complain. Some, not all, felt understandable — my opinion — lack of appreciation for what had been done to their country’s economy by the winners. 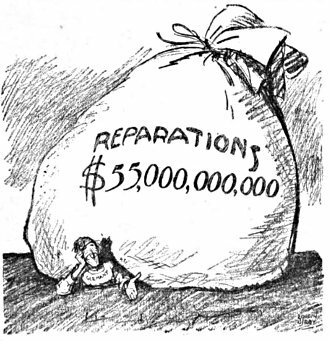 I can see how Germans might not appreciate being forced to pay exorbitant tribute — what we call “reparations” these days — while being forbidden to make ‘bad’ things, or seek ‘forbidden’ knowledge. Particularly, in the latter case, when the folks who demanded tribute saw no reason to stop building the same tech while pursuing ‘forbidden’ knowledge. Being upset in circumstances like that is, I think, reasonable. But not all possible reactions make sense. Or are, by any reasonable standard, good ideas. By the early 1930s, Germans were feeling economic hardships, like almost everyone else. What I think about it is — a bit complicated. I’ll talk about that another day. The decades since 1945 haven’t been exactly peaceful. They could have been much worse, though. Many national leaders have acted as if they don’t want to start World War III. I’m not sure how many folks took melodramatic romps — with or without atomic zombies and giant mutant frogs — and their more dignified siblings seriously. Still more topics. The last 72 years haven’t been perfect, but we seem to have learned a little. European nations have refrained from slaughtering each other’s civilians for decades. That’s very remarkable, given the region’s history. Government-level shenanigans have stayed pretty much the same, I think. At least in America. The details are different, of course. I haven’t heard “communist menace” or “creeping socialism” for years. Now it’s climate change and gun control. It’s like the song says: “You Say ‘Tomato’, I say ‘Tomato’…” Sort of. The Astaire-Kelley duet is in a YouTube video, about five and a half minutes long. Song and dance on roller skates: loads of fun. We survived both phases of the 20th century global conflict. And we’ve learned a bit. The Allies didn’t, quite, repeat the blunder they’d committed after phase one. Germany ended up in two pieces. But folks in the western half weren’t punished to the point where they’d flee to the east. Also, happily, many or most Germans were horrified by their government’s efforts to purge Lebensunwertes Leben from humanity’s gene pool. Among other things. I get the impression that nobody except a few crackpots yearn for those days of yesteryear. Or will admit it, at any rate. Eugenics’ public relations problems affected my country, too. It took several decades for folks who want a better — by their standards — humanity to rehabilitate their goals. Repackaging their efforts to purge the world of folks like me as supporting ‘quality of life’ was, I think, brilliant marketing. I don’t approve, partly because I’d probably be culled soon after the first few categories of defectives were processed. And that’s — you guessed it — another topic. The good news, as I see it, is that it’s been such a struggle to re-establish eugenic ideals. Having pretty much the same thing resurface with new slogans, not so good. But I think there’s reason to hope that more folks are learning that all humans are people. My country’s ruling class losing their former control of what we can learn helped. My opinion. I don’t miss the days when most saw the world through traditional information channels, or not at all. As I keep saying, folks learn. Slowly, but we do learn. Scientists have been learning a great deal. And, I think, developing a little wisdom. And it’s not the “wisdom” to turn away from science and suchlike wickedness, lest an irritable Almighty smite us mightily. The ‘science is bad’ attitude, adapted to a groovier outlook on life, got more traction in the 1960s. That’s another attitude I can understand, but do not share. I never considered emulating the ‘hippie’ philosophy and way of life. On the other hand, many of their concerns and hopes made sense to me. And still do. Maybe it seems odd, a Christian saying that peace, love, and cherishing nature is anything but a Satanic snare or commie plot. We’re not told that God has anger management issues and values ignorance. Which brings me to an example of that wisdom I mentioned. In my youth, prospects for large-scale weather control looked very hopeful. We may have the technology now. One reason we don’t prevent weather disasters is that field tests stopped in the early 1970s. As far as I know. We’re supposed to keep learning how this universe works. Like I said, We may already be able to change weather on a local-to-regional scale. Precision control is a serious issue. And not yet resolved. Safety protocols for experiments involving hurricanes changed after a scary coincidence in 1947. An altered hurricane made a U-turn. Then it hit parts of Florida, Georgia and South Carolina. Property damage was only $3,260,000. The death toll was incredibly low: one person. I think it helped that scientists saw where it was headed. Later analysis of the 1947 experiment suggests that the hurricane turning around wasn’t entirely due to human actions. Scientists kept the new protocols, anyway. Just in case. The next major scare came a few decades later. American courts finally decided that scientists who had modified a storm in South Dakota weren’t legally responsible for the death and destruction which followed. I can’t see World War I as all good or all bad. Or even necessary, in 20-20 hindsight. Happily, a remarkable number of folks survived both global phases of the 20th century’s wars. We even had enough survivors to rebuild most of what had been destroyed. A few generations after 1945, most of the physical damage has been repaired. Both/all sides had somehow failed to obliterate quite a few libraries, museums, and culturally-significant structures. So was what some survivors, digging out of occasionally-radioactive rubble, thought about going through the same thing. Again. Many decided that they’d had enough of humanity’s empire-collapse-rebuild cycle. I also think some Enlightenment-era ideas made sense. Basically. Seeking knowledge and avoiding state-sponsored religions makes sense. I think today’s situation looks a bit like the Enlightenment. Back then, surviving Europeans were recovering from the Thirty Years War. Today we’ve repaired most of the physical destruction from the previous century’s global wars. Or war, as I suspect historians will eventually see the 1914-1918 conflict and its 1939-1945 continuation. We’re still dealing with psychological and social issues triggered by the war. With mixed success. My opinion. ‘More of the same’ wasn’t an acceptable option. It’s just shy of 370 years since the Thirty Years War ended. I don’t know when we started using that name. Not exactly. Like I said, names change. Folks living 370 years after the end what we call World War II will almost certainly have another name for it. I don’t know what it’ll be. Maybe some will call the 1914-1945 conflict the Colonial War when 2315 rolls past. I’m not the first person to call it that. My father suggested the name, somewhere around 1970. His interests, habits and quirky mental processes were much like mine, so likely enough he’d run across the idea somewhere. Or its component pieces. Maybe he noticed the probable motives behind both phases — merging an adjective and noun to get a new name. “In the Parliament of man, the Federation of the world. I’ve since realized that “the common sense of most” still needs improvement. Or encouragement. How I see being “lapt in universal law” — is complicated. But I haven’t stopped thinking that we can build a better world than today’s. And that wistfully imagining a return to some illusory Golden Age isn’t practical. Neither is grimly clinging to the status quo. Change will happen. Which direction it takes us largely up to us. We can decide to try building a better world. Our efforts also, I am convinced, won’t see significant results for centuries, probably millennia. I see that as something to accept, and keep working anyway. It’ll be worth it. In the long run. We’ve made some progress over the last few millennia. I think the Code of Hammurabi and United Nations Charter were improvements on what we’d had before. And I am convinced that they’re not perfect. Whatever we’ve cobbled together by the time those documents seem roughly contemporary won’t be perfect, either. But I think we can build a world that’s better than today. I am convinced that we must try. I think St. John Paul II is right. The future looks — hopeful. If enough of us decide that peace, solidarity, justice, and liberty make sense. And we’re willing to do something about what we believe. This entry was posted in being a citizen, being Catholic and tagged civilization of love, eugenics, history, holidays, hope, peace, reason, science, Veterans Day. Bookmark the permalink. I don’t see any hills, or much in the way of buildings, in the more recent picture of Pozières.